« Andy Murray wins Wimbledon! Watched in Beautiful Tuscany! Today I am talking about Still being Famous in Fiano, Local Book Sales, The Mother Who Got Home for Christmas, An Old Signora & Her Dining Chair, No Newspapers in the Cafe Bar & Sig Rotund, My Man & The Squirrels, A Visit to Montalcino, Cicadas, Concert Withdrawal symptoms and not to forget the sad, but gorgeous Silvio Berlusconi. Yes, I am still famous in Fiano. A lovely lady in the doctor’s waiting room asked me if I was the famous writer (in Italian of course). She had seen my book in Milko’s cartolibreria in Fiano and asked if I could produce it in Italian. She then rummaged in her bag and out came a well-thumbed thriller which she was delighted to show me! Milko, that lovely engaging man, sold another book to an Englishman last week and I met three tourists who have promised to go and buy one! No I’m not desperate, I just gently cruise up to people in the village and hypnotize them with my writer’s card…..
Amongst all my other writing things and with the help of my very talented niece who is doing the illustrations, I will be publishing ‘The Mother who got Home for Christmas’ in the next couple of months. This is a rhyming story for kiddies and I am really looking forward to seeing the proof. I’ll keep you posted. In this commune (Commune di Certaldo) a new system of refuge collection started a couple of years ago, which we hate. So we take our rubbish to an adjacent commune on the way to the supermercato. Whilst we were unloading last week, an old Signora was placed in the middle of the street on two cushions on her dining chair. Firstly, we thought she was being put out as rubbish, however, she was actually waiting to be collected by la Misericordia to go for some medical check. (La Misericordia is a very commendable service, run by medically trained volunteers, which takes the needy to their hospital appointments – and sometimes back home again.) The ambulance arrived and the commotion of transferring the old dear to a wheelchair was unbelievable. Her daughter was prizing the cushions out from under her, to put in the wheelchair and the old lady hovered in mid-air for what seemed an agonizing length of time. Then the dining chair was removed and she was still in a sitting position! The wheelchair slowly trundled over, pushed by another ancient relic, and got to her just before she ended up sitting in the street! This may not sound funny to you, but if you had been watching this, you would have been in hysterics…….. Meanwhile the traffic queue was growing and, as always, Italians love to sound their horns! Back at the Alimentare/Bar there have been no newspapers to read for four days. Now Sig Rotund has got quite angry about this and he is a very important (and large) figure in Fiano. There has been some hold up with deliveries and they are blaming poor Milko who should go down to Certaldo and get some. My man also likes to read Il Tirenno so is equally unhappy, and I like to look at the bit in the back of La Nazione for any visiting rock bands. If there are no papers today we may have to boycott the bar like Sig Rotund! The weather here is now hot and dry, as it should be, and was a long time coming. We seemed to have missed spring and jumped directly from winter into summer. I am very impressed with my man who has decided that the only way to get the garden up together, is to rise at six and work outside until our morning coffee trip at eight thirty! This then avoids the hot sun, but unfortunately not the squirrels. No, he’s not tripping over the pretty little dark red things, they are up in the pine trees eating the pine nuts and throwing the sharp inedible bits directly at the man! I have actually witnessed this, so he is not exaggerating…..
Last Friday we took a much-needed day off from work (yes we do have a day job) and drove to Montalcino. It was a lovely day out but the Citta was a mite disappointing. It has a church at one end and a castle at the other, but no central piazza which to us is so important for a community. 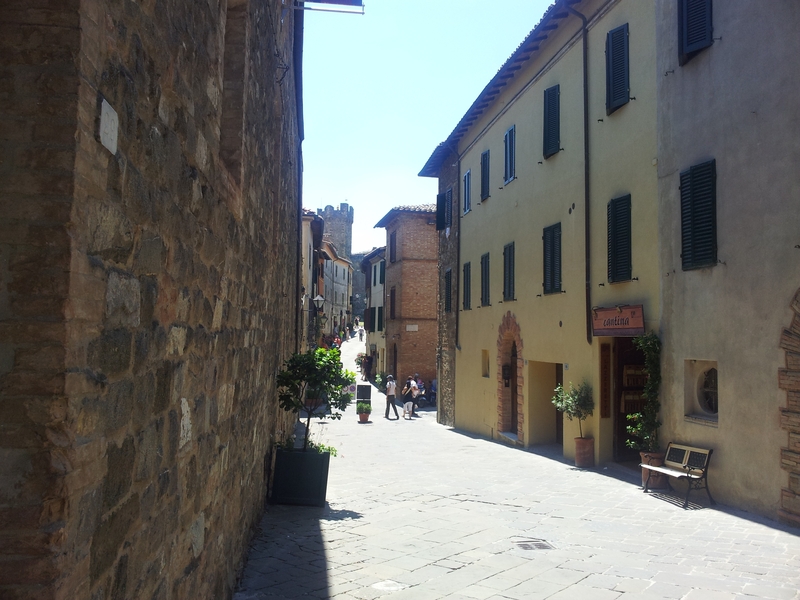 The views are panoramic, we had a nice walk along the city walls and a good lunch. So we did chill out, which is what it was all about anyway. Isn’t it amazing that you can go for years believing you are right about something and then get proved completely wrong! 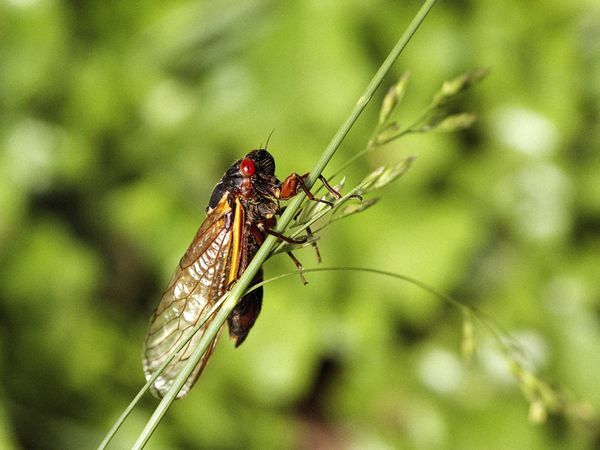 Now I am talking about Cicada’s; those noisy flying insects that you can never see in the summer because their camouflage is so good. For three years we had what we thought were cicadas wintering in our outside blinds at the old house. We actually liked these insects that were big brown grasshopper looking things and were careful not to disturb them. 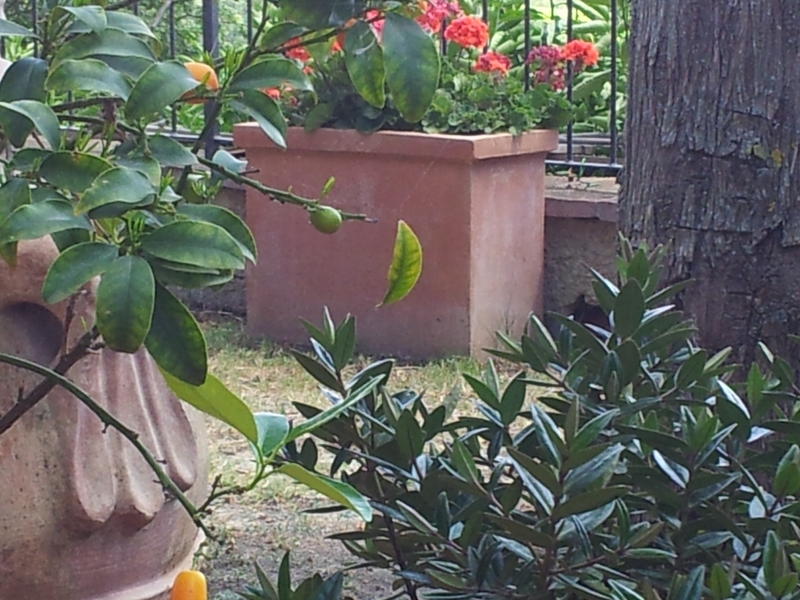 My man and I were enjoying our evening aperitivo last week and a cicada landed right in front of us, on a tree trunk and started chirping. Gosh that’s very small I said to the man, perhaps it’s a young one. So he got on his clever phone and found a picture. Lo and behold, it was normal size and the big brown ones that we had been nurturing, turned out to be locusts! It’s hard to believe that our rock concert was two weeks ago. To compensate, my man has been playing Led Zeppelin very loudly and I have already started planning the next one! 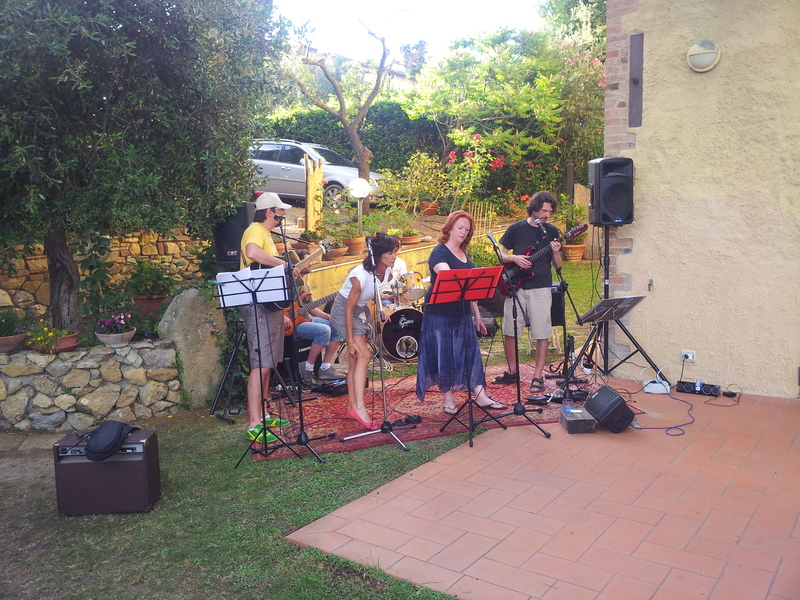 Yes, it’s a bit of a flat time after singing my little heart out with the band, however, these Chianti Hills are throbbing with live music most weekends and we can just relax in our garden and enjoy it. 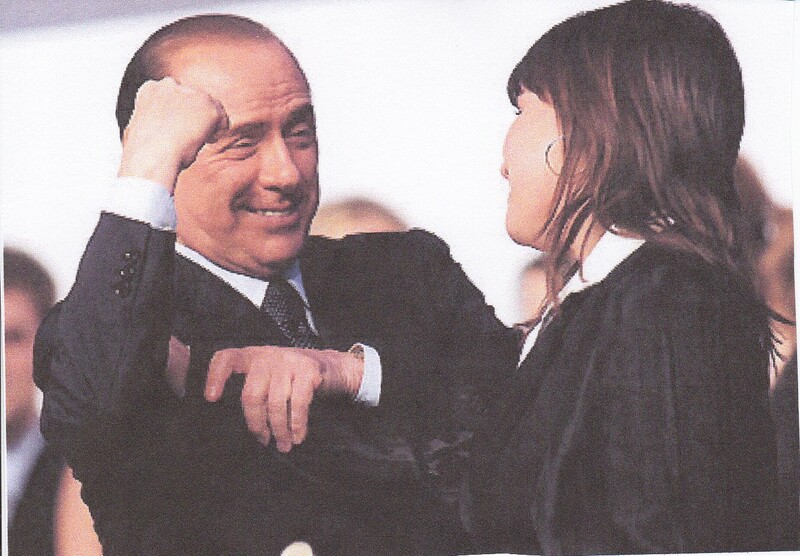 And finally, has anyone seen or heard from our idol, Silvio Berlusconi? Well there are whispers in the bar that he may be planning to do a runner with his twenty seven year old girlfriend. (A mite old don’t you think?) There have been masses of protests and just after his trial a number of his angry allies descended on a central Piazza in Rome to hold a protest under the banner ‘Siamo tutti puttane’ (We are all whores). In advance of this demonstration the organiser Giuliano Ferrara, editor of the right-wing newspaper Il Foglio, filmed a video of himself applying lipstick! So nothing unusual there then. Well must go and organise cena and may you all have a fantastic week. PS Click top right of this page, just below Blogroll, to view or buy ‘My Father, The Assassin’. Enjoy. Hi, I am enjoying your posts very much, puts me in holiday mode again! I am delighted to hear this. I write a post every weekend, however, occasionally they don’t go out until Monday, due to unforseen circumstances or a bit of creative writing block. 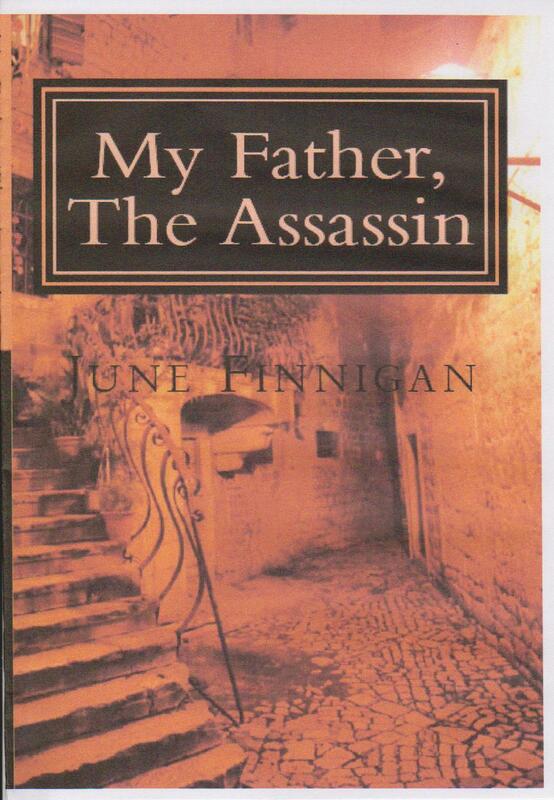 Did you by any chance read my latest novel’My Father, The Assassin’?